This is going to be a review of Winners Nutrition’s Sleep Support supplement. The manufacturer claims this product will aid a person in falling asleep faster. They state this product will stimulate brain waves for relaxation and also stimulate the body’s natural inducers for sleeping. Please read on to learn more about this product, its ingredients, and whether or not we think this is the right product for you and your sleep needs. The recommended dosage for this product is 1 tablet before bed, unless recommended otherwise by your physician. As with any supplement, it is recommended you should consult with your physician. This is not recommended for children, women who are pregnant or nursing, or those with a medical condition. This product is not meant to treat certain conditions such as sleeplessness and/or insomnia. The price for this product is $4.99 for 60 capsules. The manufacturer does not offer any bulk discounts. They also do not offer any price matching either. In their FAQ, they state their prices remain competitive. There is no mention of a guarantee and the return policy is rather strict. If you wish to return an item to the company, you will need to: notify them, make sure to ship it back 14 days after the sale, make sure the product is unopened and in resalable condition, and also in its original packaging. There is no mention of any sort of consumer satisfaction on their website. As for customer reviews, there are none to be found. The website does not have any feedback for this particular product. So while the price may be appealing, the lack of reviews is something to keep in mind while you are shopping around. 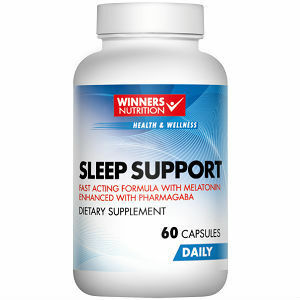 Winners Nutrition’s Sleep Support supplement may seem like a winner upon the initial glance; however, some things should be taken into consideration before purchase. The lack of customer satisfaction and strict return policy makes this product less appealing to those who wish to find a new sleep support supplement. Also the lack of customer reviews is alarming as well. Products that work are often backed up with glowing reviews, this product had none. Finally, there is no discount for those who wish to purchase the item in bulk. While this product may seem promising, some factors may make this supplement less than ideal to purchase and try and this is why we feel this product will not be ideal or meet your sleep needs. The company boasts a proprietary blend to help induce sleep faster; however without any evidence to support these claims, the customer would just have to go based on what the manufacturer states. If you are currently looking for a sleep support supplement to help you fall asleep quicker, you may want to purchase another product and skip Winners Nutrition’s Sleep Support Supplement. Bernard Spradlin	reviewed Winners Nutrition Sleep Support	on October 16th	 and gave it a rating of 2.5.